In the early 1990’s, German sports car manufacturer Porsche was facing hard times. Sales were slumping in the US, their largest market. The company was small and their only three models - the 911, 944, and 928 - were viewed as boutique sports cars. Competition in the market segment from cars like Acura NSX, Toyota Supra, BMW 3-series sports cars like the Z3 and Z8, and even upstarts like the Dodge Viper was intense. Porsche was staring down the barrel of bankruptcy. Porsche enthusiasts might look at this period as the catalyst for what the company has become today. Wendelin Wiedeking was promoted to CEO in 1993 and is largely credited with Porsche’s turnaround in the late 1990’s. The company put dramatic process improvements in place and expanded the model lineup with the popular Boxster in 1996 and eventually with more models like the Cayenne, Cayman, and Panamera. Porsche's troubles in this era led to another little-known gem for German automobile enthusiasts. Around the same time, an automaker across town was having their own problem. Mercedes-Benz wanted to build a high performance sedan to compete with BMW’s newest generation M5, but could not fit the V8 from their SL-Class convertible into their E-Class sedan. 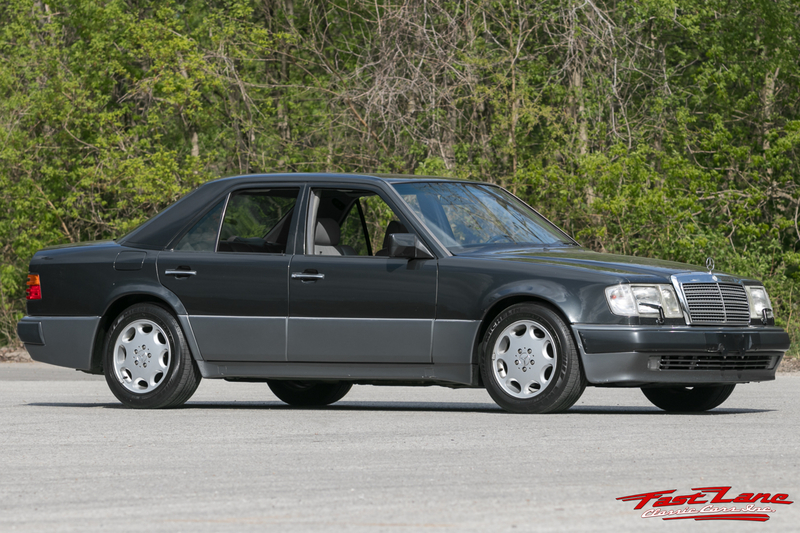 Knowing that Porsche was looking for new revenue streams, Mercedes reached out and a deal was made to jointly design and produce the Mercedes-Benz 500E. Porsche started designing the car in 1989, and after widening the fenders and making changes to the suspension of the E-Class, were ready for production by 1991. The 500E was primarily produced from 1991 to 1994, and only 10,479 were made. Each car was assembled by hand, and took 18 days to complete. During production, the car was transported between the Mercedes and Porsche manufacturing plants in Zuffenhausen, Germany. The naturally aspirated 5.0L V8 engine with 300+ horsepower and upgraded front and rear brakes were from the 500SL roadster. On the road, the 500E is easily distinguishable from a vanilla E-Class sedan. It has a wider track, lower profile, flared fenders, side skirts, front air-dam, and wider tires. Because of its look, limited numbers, hand-built construction, and unique pedigree, the Mercedes-Benz 500E is already considered a classic.